You can support this website by purchasing high-resolution images or prints from me. You can do so by following the instruction below. High-resolution images are $10 each. They will be in high quality jpeg format and free of copyright watermark. Visit my website and note down the file name(s) of the image(s) - you can do this by clicking on the image, this will bring up another window/tab with a medium-res image (usually 1200x800), note the the part of the URL for each image after the domain (http://www.travelerathome.com) to identify each image you wish to order, this is typically something like: 2013_big_day/prothonotary_warbler1.jpg. An illustration can be seen here. Make a payment via PayPal by clicking the "Donate" button at the bottom of this page. See price list below. Send me an email at: howiewu1 _AT_ gmail _DOT_ com, listing the file names of the images you want to purchase. Note: Be sure to send the email from the same address with which you made the PayPal payment, so I won't get you confused with someone else. Also make sure you have enough space in your mailbox to receive the image files (as they can be very large, usually exceeding 10MB each). 1) All photos are printed on Kodak Professional Endura Supra Glossy paper. 2) If you order consists of prints of different sizes, the shipping and handling charge will be that for the largest size print. S&H charge is regardless of number of prints. 3) Please allow 5-10 business days for delivery. 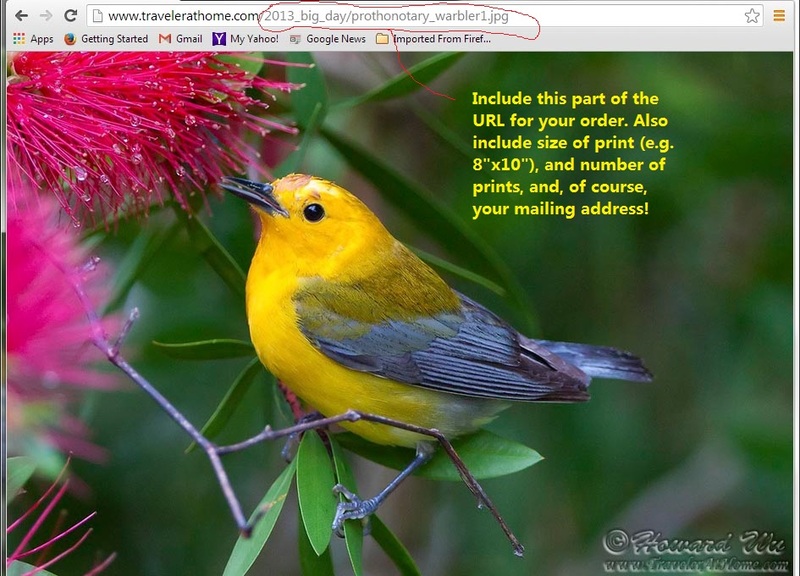 Be sure to include the part of the URL for each image after the domain (http://www.travelerathome.com) to identify each image you wish to order. An illustration can be seen here. You will only use the image(s) for personal purposes (e.g. you can use them as computer desktop background, you can print them and mount them on your wall, etc. You will not digitally duplicate these images and transmit them to anyone else (you may make copies for yourself for backup purpose, etc.). You will not use them for commercial purposes (e.g. incorporating them in sales brochures, flyers, or other publications). For commercial purposes, my pricing is different, please email me for details. I (Howard Wu) retain full copyright of all images. You can also purchase my images from Dreamstime, but you get much better deal when you order directly from me! If you read Chinese, the best way to support me is to purchse my book, A Cross-Country Summer (横穿美国的夏天，in Mandarin Chinese), see here for order instructions. You may also make a donation without purchasing any images, please choose an amount you wish to contribute, and I much appreciate your kindness. Your donation makes it possible for me to keep this website running and bringing you fresh images!